Are You looking for the top of comforts during your holiday? Do You want to spend a relaxing holiday in the Amalfi Coast? Are You ooking for 4 star hotels Amalfi Coast? Well..here we are to satisfy your needs. Bristol hotel was built in 1971 by Vittorio Mendozzi who designed it with his own hands. Today his sons Giuseppe and Giancarlo manage it in the most excellent way. 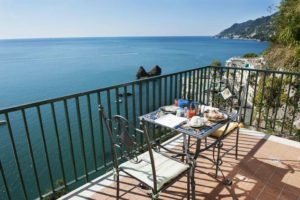 Top hotels Amalfi Coast: are You still wondering why this is one of the top hotels? Thanks to our 40 years experience on hosting we are able to treat guests in the best way. We have outer swimming pool but, in case You prefer swimming into the sea, we are 50 meters far from the sea and free beach and 300 meters far from bathhouse. You will relax under the shadow during the hottest season with all the services You need on the shore, plus an emerald and transparent sea. Have You had a look to our rooms? You can choose among a variety. Keep on reading to know them all. Our rooms are decorated with traditional Vietri pottery. Some of them have a wonderful view but, let’s see the services they hide. We remember You that in everyone are included breakfast, free WIFI, air conditioning, heat, minibar, TV and safe. Which transport are You going to take to reach us? It isn’t complicated getting to our hotel. Depending on where You arrive we leave You here the solution. The most common way to get to Amalfi Coast is landing to Capodichino airport. In this case, take bus or taxi to Naples Central Station, there will be the train to Vietri sul Mare. If You arrive to one of Rome airports, get to Tiburtina or Termini and take a train for Salerno. In Salerno You will take another train (called treno metropolitano) that in a pair of stops will bring You here in Vietri! If You come by car, be prepared to this: there will be a lot of traffic. Anyway, here is a detailed description. Thanks to our experience we can offer event service to our guests. Do You want to plan a meeting or business event here in Bristol Hotel? Are You looking for Amalfi Coast Italy wedding? Why don’t ask for a free quote? Here is the page to send us your questions or doubts. Our facility has enough space to organize events until 200 people. You can choose between an outdoor or an indoor event. Your guests can stay for the night in our rooms at the end of your event. We’ll be glad to welcome them! Thank You so much for visiting us, we wait for You here in Bristol hotel, don’t You forget to book or ask for a free quote. We wish You a nice holiday!